One bright Saturday morning while on a walking loop through the village, I was delighted to see and witness a number of signs of improvement to our architecture and real estate health. Such a sense of wellbeing was first made manifest at the Farmers’ Market on Lake Street. The sun-drenched bazaar with its bluegrass band, fresh donuts, mounds of healthy colorful vegetables, flowers and a stream of smiling citizens can make any day a great day. Filled with optimism, I wandered to Lake and Oak Park to get my fix on houses for sale, I paused to review the posted listings displayed in the Baird & Warner storefront. What was going on here, most all the 20 properties were proudly marked as Sold? Baird & Warner had a good month. Continuing down Lake Street, I was happy to see that a shiny new Fannie Mae sign had been erected above the old Benetton’s storefront. What a great use for this tiny storefront between the theaters and Starbucks. Across the street and down the block in what was the old camera store stood a freshly rebuilt storefront. With its clean red brick and limestone lintels, it stands out contrasting the exposed black iron structural framing with painted gold decorative details. Garapolo/Maynard were the architects. The project won a Historic Preservation Award this year as a handsome addition to the street, certain to attract some interesting retailer. The same architects across the street are building a new Potbelly’s sandwich shop, which is sure to reenergize this prime corner. Proceeding down Forest, while weaving through the architecture buffs freshly off their tour busses, the optimistic theme continued. Wright is as popular as ever regardless of the state of the economy. Passing by the old Villager Grocery, I met Brett Showalter, owner and builder of the new Doggie Day Play Shop. Good to see a new age use for the building — along with the unveiling of the terracotta art deco facade that has been obscured for years. Showalter was quite enthusiastic about the new business and impending opening. A block down at Prudential Premier Reality, I found myself engaged in another sidewalk real estate discussion. My street acquaintance casually remarked that, "The prices and the low interest rates have created great buys — this is probably the best time in our lives to buy houses." 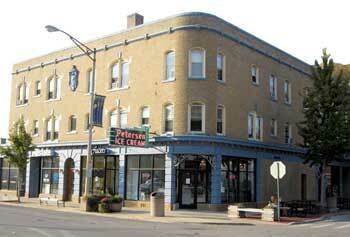 Across the street, the Petersen’s Ice Cream building restoration has just been completed. The storefronts are all leased and occupied and Petersons is right sized and back into the east storefront with its corner entry reborn. The iconic Petersons sign has been restored and re-lamped with Art Deco neon light. The whole building looks great and it is again the anchor of the block after years of being shuttered. Moving on north, I counted at least three contractor signs planted in front of homes per block. It appears that most of the projects were small but people are investing in their homes. Upon turning a corner, I was delighted to see what was an eyesore hole in the ground for two years had suddenly become this big white box neatly wrapped in white Tyvek. Being a self confessed House Junkie, I could almost hear the collective sigh of relief from the neighbors on this charming block. Half-built homes have popped up all over Chicago and the suburbs, regardless of the location. This house on Marion can now be taken off the to-watch list. On Forest, I stopped at one of my projects (an 1894 Queen Anne house) to check out some trim details and paint samples. Site visits are the most exciting part of being an architect. This is where we see our plans on paper come to life as three dimensional forms and spaces. Building has always been such an optimistic act — something we planned and designed for the future. I give myself a light pat on the back, knowing this substantial home renovation, which enlisted the work of contractors and suppliers, contributed to making things better. It just confirms that there really are signs of life. Garret Eakin is a practicing architect that has lived in Oak Park for 20 years. He is also a preservation commissioner and an adjunct professor at the School of the Art Institute.